Amak to Harold..."I can't waste the life I've been given by standing still and lamenting the past until my days run out. I must get up and fight; I must keep providing for my family. I must keep moving forward, not just for myself, but also for my daughter and for all those who are no longer with us. Because in the end, that's why we're here, right? The only reason we are given life is to live it." This is not a genre that I normally read but I found that I really enjoyed this book. It was a creative and touching story about life and regrets for past mistakes and finding peace in life no matter your age. Mary Rose and Howard Grapes are being forced to move from their house on top of a cliff due to the danger of where it is located. They will be moving into a retirement away from the sea that they have always been close to. During the night before their move, the house falls into the sea intact and floats away with Mary Rose and Howard inside. As their past lives fall away behind them, they learn to love and forgive each other for the death of their son 35 years earlier. 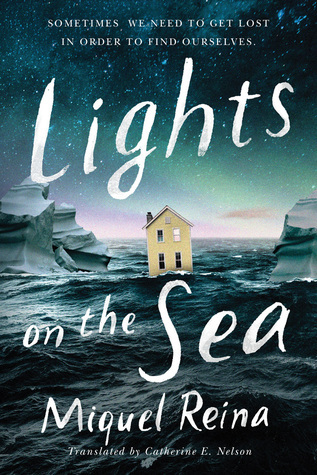 Wildly imaginative, deeply poignant, and entirely unexpected, Lights on the Sea sweeps readers away on a journey of fate, acceptance, redemption, and survival against the most rewarding of odds. It's a beautifully told story about love and forgiveness and changing your life and attitudes no matter how old you are. It made me cry in parts but the overall feeling at the end was of redemption and not sadness. Have you entered the current giveaway sponsored by #JORDWatch?